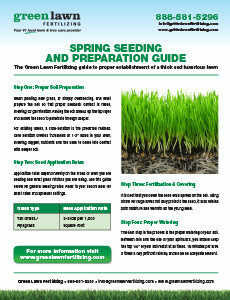 As with most young things, young grass needs special care and attention. 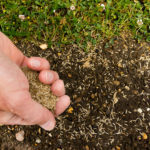 If you have recently seeded your lawn and want to learn how to care for it properly as the seeds mature into tall, strong grass, check out the post-seeding tips below. Once your lawn has been seeded, the soil should be thoroughly watered immediately following the seeding and then frequently but lightly watered for the first 2 weeks. The ground should always be moist and never dry, but watering long enough that puddles form should be avoided. An automatic sprinkler system is the best way to maintain your new lawn during the first 2 weeks. It is also very important to keep people and animals from walking across freshly seeded turf, to the extent possible. Keeping pets mainly indoors and putting up barriers or signs to remind yourself and others not to step on the growing grass will help you avoid disrupting the initial growth period. When your lawn has been seeded for 3 weeks, it is time to begin watering more heavily and less frequently. You should still avoid watering so much that puddles form, but the ground should become moist enough that it is fairly easy to push your index finger into the soil to the knuckle, though if the soil is equally permeable 4 or more inches down you should reduce the watering time (this can be tested using a butter knife, metal ruler or other 4 inch+ implement). If you have been careful about watering up until the fourth week, the baby grass should be strong enough that it is starting to send roots deep down into the soil. To make the soil as welcoming for these roots as possible, water for longer at a time, but cut down the number of times you water the lawn per week to about 3. As the grass will be growing tall from here on out, mowing is ok again, as long as you wait to mow until the grass is dry (this is good practice for grass of any age). As the grass begins to spread itself and cover your lawn more evenly, expect to see weeds appearing among them. When you treat your lawn well, various weeds will take advantage of that fact. However, you should wait until about 2 mowings later to take any action against the weeds, as attempting to exterminate weeds earlier risks hurting the grass. 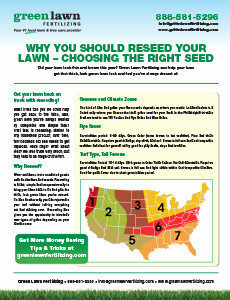 Read more about lawn care seeding in the Philadelphia tri-state area by downloading our seeding guide. 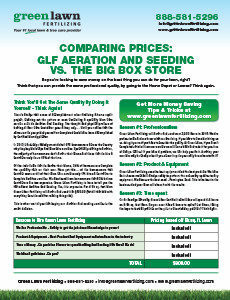 And if you haven’t seeded or you’re just starting to plan, read our big box store comparison guide where you’ll find the benefits of hiring a professional lawn care company to complete your aerating and seeding tasks as opposed to doing it yourself. Yes! 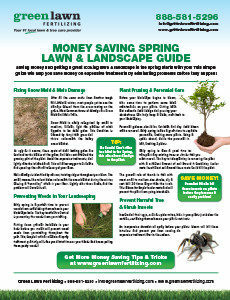 Finally something about lawn care watering tips.